Keywords: Shangaan; Gonarezhou; co-existence; conservation; ecology; eviction; poaching. Sleutelwoorde: Shangaan; Gonarezhou; saamleef; bewaring; ekologie; uitsetting; stroping. On the eve of the occupation of the country in 1890, Gonarezhou was the land of the Shangaan people, also known as the Tsonga or Hlengwe.4 Soshangane Manukusa, the founder of the Shangaan (Gaza-Nguni) kingdom entered southern Zimbabwe in about 1821 and conquered and assimilated the local Tsonga, Hlengwe, Ndau, Ronga, Chopi and Tswa clans of the area. The Gaza-Nguni remained the undisputed rulers of south-eastern Zimbabwe until their downfall in 1896.5 While in charge of the land, they evolved a lifestyle based on a mixed economy which took full cognition of the climatic hazards of the area and the challenges arising from attacks by bugs such as tsetse-flies. Adaptation to the environment made them survivors in an area that was climatically hostile. Their forced removal from the land of their ancestors put them at loggerheads with the colonial state as discussed in the case studies under review which are representative of the communities that were most affected by the massive evictions of the period from 1957 to 1968 and so put up the most noticeable resistance to the game park scheme. This article is firmly supported by archival material sourced from the National Archives of Zimbabwe and the Masvingo Records Centre. The material housed in these archives includes official correspondence; government/statutory documents; delineation and annual reports generated by colonial officials from the Native, Commerce and Transport, Law and Order and National Parks' Departments. The study profited from the memoirs of Allan Wright who worked as the district commissioner of Nuanetsi during the years under focus; and also from information gleaned in a colonial journal, the Native Affairs Department Annual which was first issued by the Native Affairs Department in 1923. Furthermore, the research was enriched by information gathered from oral testimonies made by members of the Shangaan community of south-eastern Zimbabwe who lived through the trauma of evictions. These interviews were conducted between 2013 and 2015 when collecting data for my doctoral studies. They captured the emotions and reactions of people who had either experienced the ejections directly or witnessed them from the side-lines of the park. The deliberate interview focus was on recovering the voices of the marginalised Shangaan people. The article also draws heavily on the abundant secondary literature on the colonial empire, national parks and forced removals. Such works include academic texts, theses and journal articles. The qualitative research method was employed to select, present and analyse the material gathered. As background to the Gonarezhou eviction discourse and to situate the discussion in its correct historical context, it is necessary to point out that the Shangaan had developed symbiotic relations with the fauna and flora of their environment before their homeland was turned into a game reserve. The intricate nature of their milieu dictated that they practise a mixed economy that was centred on subsistence cropping, hunting, raising of stock, fishing and gathering of fruits, plants and vegetables. Admittedly, theirs was a dry area that suffered from intermittent droughts but the people had developed ingenious survival tactics which enabled them to adapt in the best possible way to their veld. While acknowledging that the region was prone to perennial droughts, it is not entirely true that the inhabitants were bad crop producers. The local people took full advantage of their understanding of the environment and adapted their agricultural practices to the low rainfall of the region by cultivating small grains, conducting irrigated riverbed farming and practising crop rotation on dry lands.13 Their alleged agricultural ineptitude appears to be overstated or perhaps deliberately distorted by colonial authors to fit into the indolence mantra they were propagating. Where conditions allowed, the Shangaan producers excelled in crop production. It is therefore evident that living in Gonarezhou, the Shangaan cultivated a special relationship with their ecology. The place supplied them with basic daily needs: meat, fish, pastures, fruits and vegetables. Furthermore, the Gonarezhou forest provided them with firewood and was also home to the graves of their ancestors. It became a site of supplication. It is clear that the land could not be taken from the people without dire consequences. Unquestionably, its transformation into a game reserve was destined to demarcate lines of confrontation between the community and the authorities. Displacements in Africa were tainted by an added racial dimension whereby indigenous blacks were accused of having limited appreciation of nature and of being "first-class poachers". They had to be removed from parks if the ecosystems of such areas were to be preserved.30 Jane Carruthers contends that the establishment of the Kruger National Park in South Africa was followed by massive evictions of indigenous communities from the park area.31 Similarly, the creation of the Wankie Game Reserve in 1927 and the Matopos Game Reserve in 1930 in Rhodesia was followed by concerted efforts to evict the resident populations from the areas.32 Similarly, the declaration of the Gonarezhou land as a game reserve in 1934 triggered a process of removing indigenous Shangaan communities from the game-designated area. The emphasis was on removing the people because in practical terms it was "impossible" for them to co-exist with the wildlife. This was an opinion supported by the divisional road engineer and the assistant native commissioner of Nuanetsi.38 It was a viewpoint couched in the new paradigm prototype called fortress conservation that contended that Western wildlife protection management systems were superior to the wasteful and destructive local conservation practices.39 Such beliefs were untrue. Facts on the ground reveal that many African communities had managed their fauna and flora responsibly in pre-colonial times. What was certainly true, however, was that the label was consistent with imperial historiography. So, in a bid to justify land use change, south-eastern Zimbabwe was given all kinds of labels. It was arid, uninteresting, waterless, disease-ridden, useless for cropping and unfit for human habitation.40 It was claimed that most of the land that later became the GNP had been unoccupied in 1890 when the colonial government took over.41 Consistent with this mind-set, P. Forestall, the first native commissioner of Chibi roundly condemned the entire Lowveld landscape as unsuitable for human occupation and suggested that it be turned into a game reserve.42 Later, colonial reports continued to hammer on the need to remove the "small groups" of the Shangaan from the Gonarezhou milieu for their own good and that of wild animals.43 The argument proffered was that the Gonarezhou land could only assume a "new value" after being converted to a game reserve. What was also evident in the Gonarezhou eviction debate was the matrix of power relations during the colonial period, or to put it more precisely, the hegemony of the colonial empire. The broader picture was the control and protection of the conquered, the benign tutelage of the subject people. It was, ironically, a question of protecting the interests of the colonial subjects without fully consulting them, a common characteristic of the imperial state. In this particular case, British imperial guidance depicted as rescuing the Shangaan from the "climatic hazards" of an area that they had, incidentally, lived in all along. What was furthermore revealed from the eviction conversation was the extension of the imperial arm of the state into an area perceived to be far from administrative centres such as the native commissioner's office. The people were to be quarantined into native reserves where they would be easily controlled. This was also a confirmation of the political control of this remote area of the country. Thereafter, together with the like-minded people, he worked tirelessly towards converting the vast Lowveld area into a national park.48 Thus, the period between 1957 and 1968 witnessed intensified government efforts to remove all the Shangaan who were still living in the GNP, and the Chisa, Ngwenyeni and Xilotlela communities were targeted. Their contestation to eviction from the land of their grandfathers is the focus of the discussion that follows. As shown earlier, there were still large numbers of the Shangaan in the game- designated area right into the 1950s. Most were concentrated around the Sabi-Lundi junction.49 These people were constantly reminded that they were illegal residents who would have to vacate the area sooner or later. The growing rumour in the early 1950s was that they were to be moved to Matibi No. 2 and Sengwe reserves (shown on Map 1) and their lands turned into a Special Shooting Zone, effectively making it an exclusive game area.50 Another rumour, which was not entirely untrue, was that they were going to be joined by Ndebele and Karanga-speaking people from other parts of the country in their new settlement areas.51 The Chisa, Ngwenyeni and Xilotlela communities put up strong resistance to eviction from the home of their ancestors. The protest of the Chisa came in the form of open resistance to the game reserve scheme; and this unrest intensified from the mid-1950s. Game boundaries were re-drawn in 1957. These expediently coincided with the downgrading of the Chisa chieftainship to a headmanship. The demotion was, in all certainty, punishment for the chief's opposition to the game reserve project and his general insubordination.55 The relegation, understandably, increased tension between the state and the Chisa community and turn the Chisa into more hardened and uncooperative subjects for most of the colonial period. It should be noted that the 1950s and the 1960s were a period of intensified political tension in the country as a whole which culminated in the rise of militant African nationalism. The era witnessed the formation of radical nationalist political parties that instigated resistance to the colonial state and demanded self-governance.56 The action of the Chisa people should be understood in this broader national mood. While Chisa was assured that he would return to the Seven Jack area after the elimination of ndhedzi, the agreement was never honoured. The area was soon afterwards leased to Ray Sparrow, a white rancher who, ironically, converted it into a cattle grazing area.62 In 1974, another veterinary fence was put up in the disputed area thus putting an end to Chisa hopes that they would return to the Seven Jack area. When the status of the game reserve was changed in 1975 to that of a national park, the Seven Jack area was incorporated in its entirety into the GNP, with the "temporary" 1962 veterinary fence becoming the official boundary. This move heightened tension among the already agitated Chisa community. Headman Ngwenyeni of Marhumbini lived south of the Sabi-Lundi junction.63 His headmanship had been recognised by the native commissioner, Forestall, in 1898 when the headman was appointed supervisor of the British South Africa Company territory adjoining south-eastern Rhodesia and PEA. However, to the disappointment of the Rhodesian government, the headman continued to give allegiance to his paramount chief Mavube across the border, now under Portuguese administration. Notably, he continued to act as if he was a Portuguese subject, an embarrassing situation to the Rhodesian government.64 This misplaced allegiance was perceived by the government as an act of defiance but may have arisen out of ignorance on the new line of command. Displayed in Wright's reasoning was, surely, an inherent contradiction in his game park perception. For him to now argue that humans and game could indeed co-exist because he wanted to retain the Bengi Springs area in his park project was without doubt, sly and selfish. Again, as W. Wolmer correctly observed, Wright's suggestion for the Ngwenyeni people to remain in the game-designated area revealed another innate contradiction whereby one wildlife "wilderness" would thrive with human beings in it, yet others would be spoiled by the presence of humans.69 This was indeed an incompatible contradiction! It was no surprise that the people of Marhumbini resisted movement from an environment that had sustained their lives for a long time.70 Faced with stiff opposition from the Ngwenyeni, the government opted for a compromise position in which D.C. Wright and A. Fraser (the director of wildlife conservation) agreed with the Ngwenyeni in 1963 that they remain at Marhumbini. That way, the Bengi Springs area was saved from being turned into a native reserve. The people were, however, warned that those found poaching would be summarily evicted. They were also required to provide labour on the GNP projects such as fencing and maintenance as part of showing their gratitude. They were also barred from accommodating additional people into the area.71 Such stringent conditions only served to heighten tension over the ownership of the Gonarezhou land. Their resistance and continued defiance was, without doubt, a clear case of the people's self-assertion and a refusal to be taken for granted. In addition, it was an attempt to declare and confirm their indigeneity to the area and an assertion of the value they placed on their heritage; they were prepared to defend thisat all costs. Broadly, theirs was an act of indigenous resistance to colonial oppression, an anti-imperial struggle consistent with the national political agitation of the 1950s and 1960s. It turned out that this was a well organised protest meeting led by the traditional leadership. Headman Xilotlela had planted his spokespeople strategically in the crowd and told them to express their opposition to relocation to a site away from their ancestral land. They added that they did not want to move to the new site because it was a place they had avoided in the past because of its aridity. In the end, a negotiated deal was struck whereby the Xilotlela people would remain in their homeland but without cattle. While the cattle position was officially explained as a tsetse-control measure it was, without doubt, punitive action, a "slap on the wrist" for their supposed obstinacy. As further punishment, soon thereafter Xilotlela's area was re-designated a Special African Area and a buffer fence was erected,90 supposedly to protect the people from game. While the community had won the battle to remain on their fatherland, the full war was yet to be won because they were harassed repeatedly throughout the colonial period for allegedly poaching and crossing the borders (South Africa and Mozambique) to conduct illicit activities. What they had demonstrated, however, was that they were no pushovers. For that, they were greatly admired by their neighbours. 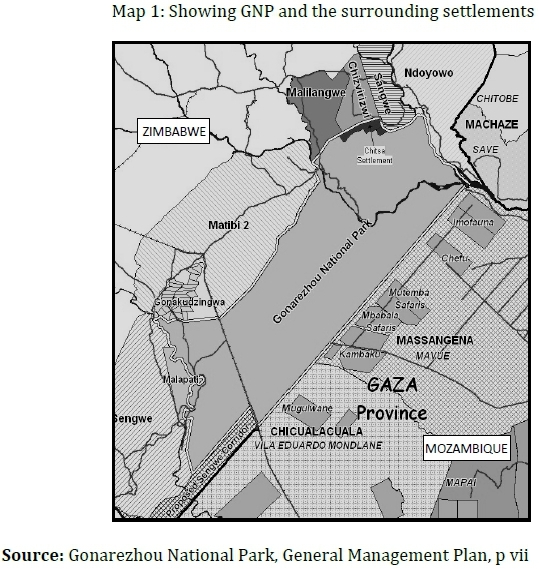 The final boundaries of the Gonarezhou game reserve were demarcated in terms of Government Notice No. 776 and 777 of 1968.91 By the end of that same year, all the GNP residents, irrespective of earlier agreements, had been removed and settled in marginal lands abutting on the park. These were lands which, incidentally, were already overcrowded by earlier settlers and recent immigrants. However, the people continued with their war of defiance against the park establishment from the fringes of the protected area. Poaching and laying snares in the contested GNP escalated as the aggrieved people continued their practice of kuhlota (hunting), given their limited survival options outside the park. Park officials recorded increased poaching incidents in the GNP following the total removal of the people.92 It was reported that in 1968 alone, 63 African poachers were apprehended in the park for contravening the park's regulations. The Department of Parks also indicated that poachers were becoming more aggressive when confronted by law officers, a sign of increasing tension.93 The escalation of poaching that characterised the post-1968 period was a clear indication of the changing nature of the struggle for control of the disputed Gonarezhou territory. The three case studies discussed above illustrate the hegemony of the Rhodesian colonial government. It simply appropriated the responsibility of re-allocating the indigenous people's land to create a wildlife sanctuary - without so much as consulting the affected communities. It removed them from the land, often using force. This made for sour relations with the local people; there was ongoing dissatisfaction and confrontation throughout the period under study. The case studies also revealed the forms of resistance adopted by the indigenous communities living in the area. The studies demonstrated how the traditional leadership engineered such resistance, although rather indirectly. This was especially the case with the Ngwenyeni and Xilotlela communities. While such resistance yielded temporary eviction reprieves it did not, in the long run, prevent the colonial government from imposing its will and removing all the park's residents by 1968. This article focused on the resistance of the Shangaan indigenous communities of south-eastern Zimbabwe to eviction from the GNP. It demonstrated how the evictions were part of a broader colonial scheme to deprive indigenous communities the use of their lands for subsistence. The study revealed that the Gonarezhou case was not an isolated one but consistent with park-induced evictions elsewhere on the African continent. Fundamentally, the study illustrated how the formation of a game sanctuary on Shangaan lands was in itself a statement of conquest and control by the colonial state. The introduction of a new form of wildlife management based on Western-styled conservation methods was alien to the local people. It forced them off their traditional lands, deprived them of their livelihood and was imposed on them without consultation. The study thus revealed that the interactions the Shangaan had developed with their veld and their environment were disrupted by their ejection from the Gonarezhou land. The veld that had provided them with land for cropping, pasture lands, meat, fruits and vegetables became a no-go area under the new conservation model. When faced with eviction from the land of their forefathers from the mid-1950s, the Shangaan resisted. The article used three case studies of the Chisa of Gotosa, Ngwenyeni of Marhumbini and the Xilotlela of Vila Salazar to demonstrate the different forms of contestation, including passive resistance, the mobilisation of the traditional political institutions and open confrontation with the colonial government. Such resistance aroused the wrath of the state and gave rise to the angry confrontation that characterised the entire eviction period from 1957 to 1968. In the end, the colonial state triumphed and used its might to dislodge the Shangaan from the land of their forefathers. * He is currently conducting research on marginalised borderland communities of Zimbabwe. For his PhD studies, he focused on the contested history of the Gonarezhou National Park space. 1 . At the time of its establishment in 1934, it was called the Gonarezhou Game Reserve. This status was changed in 1975 to the Gonarezhou National Park. In 2002, it joined with Mozambique's Limpopo and South Africa's Kruger National Parks to form an enlarged conservation zone called the Great Limpopo Transfrontier Park. 2 . E. Gandiwa, "Wildlife Tourism in Gonarezhou National Park, Southeast Zimbabwe: Opportunities for Wildlife Viewing", Journal of Sustainable Development in Africa, 13, 1 (2011), p 305. See also National Archives of Zimbabwe (hereafter NAZ): SRG/3, Annual Report of the Director of National Parks and Wildlife Management, 1979-80 to Minister of Natural Resources and Tourism, the Hon. Victoria Chitepo (by Dr G.F.T. Child), 1981, p 21. 3 . Note that Ndowoyo is incorrectly spelt as Ndoyowo on Map 1. For Shangaan displacements in southern Zimbabwe, see, Masvingo Records Centre (hereafter MRC), MS 18, Delineation Report on the Chitsa Headmanship and Community, Chief Towani: Sangwe T.T. Land, Zaka District; and MRC: MS 22 Delineation Report on the Ngwenyenye or Marumbini Headmanship and Community, Chief Chitanga: Gona re Zhou National Land. 4 . The Shangaan, Tsonga or Hlengwe of Zimbabwe constitute a very small percentage of the country's population. Their larger numbers are found across the borders in Mozambique and South Africa. 5 . For detailed accounts of the Gaza-Nguni incursions, see G.J. Liesegang, "Aspects of Gaza Nguni History 1821-1897", Rhodesian History, 6 (1976), pp 1-14; J.D. Omer-Cooper, The Zulu Aftermath: A Nineteenth-Century Revolution in Bantu Africa (Longman, London, 1966); H.A. Junod, The Life of a South African Tribe, Vol. 1 (Macmillan, London, 1927), pp 16-19; A.K. Smith, "The Peoples of Southern Mozambique, An Historical Survey", Journal of African History, 14, 4 (1973), pp 565-580; J.H. Bannerman, "Hlengweni: The History of the Hlengwe of Lower Save and Lundi Rivers from the 18th Century", Zimbabwean History, 12 (1981); G. Mazarire, "Reflections on Pre-Colonial Zimbabwe c. 850 to 1880s", in B. Raftopoulos and A. Mlambo (eds), Becoming Zimbabwe, A History from the Pre-Colonial Period to 2008 (Weaver Press, Harare, 2009); and E. MacGonagle, Crafting Identity in Zimbabwe and Mozambique (University of Rochester Press, Rochester, 2007), p 93. 6 . National Archives of Zimbabwe (hereafter NAZ): S2929/8/4, Delineation File, Nuanetsi, H.E. Summer, Provincial Commissioner, Victoria to DC of Nuanetsi, 15 May, 1973; W. Wolmer, From Wilderness Vision to Farm Invasions, Conservation and Development in Zimbabwe's South-East Lowveld (Weaver Press, Harare, 2007), p 82; and A. Wright, Valley of the Ironwoods (Transvaal Printers, Cape Town, 1972), p 201. 7 . NAZ: S235/504, Annual Report, Gwanda, 1926. 8 . NAZ: S235/505, Report of the Assistant Native Commissioner, Nuanetsi for the Year Ended 31st December 1927; and NAZ: N9/1/17, NC Annual Report, Chibi, 1914. 9 . E.D. Alvord, "Agricultural Life of Rhodesian Natives", Native Affairs Department Annual, hereafter, NADA, 2 (1929), p 9. 10 . J.H. Bannerman, "A Short Political and Economic History of the Tsovani, Chisa and Mahenye Dynasties of the Ndanga, Chiredzi and Chipinga Districts to c. 1950", Unpublished paper, undated, p 14; and F. Elton, "Journey of an Exploration of the Limpopo River", Unpublished paper, Royal Geographical Society, London, 1873. 11 . National Museums and Monuments of Zimbabwe (hereafter, NMMZ), Report by D. Simpson and S. Booysens, "Animal and Plant Ecology Report", Rhodesian Schools Exploration Society, Gonarezhou Expedition, Salisbury, 1962, p 68; Bannerman, "A Short Political and Economic History", pp 13-14. For another perspective on the cultivation of traditional grain crops to mitigate drought, see B. Tavuyanago, N. Mutami and K. Mbenene, "Traditional Grain Crops in Pre-Colonial and Colonial Zimbabwe: A Factor for Food Security and Social Cohesion among the Shona People", Journal of Sustainable Development in Africa, 12, 6 (2010), pp 1-8. 12 . Interview with Mukhacana Chauke, Mahenye, 7 August 2014. 13 . Bannerman, "A Short Political and Economic History", p 14. 14 . See, among others, St. V. Erskine, "Journals of a Voyage to Umzila: King of Gaza, 1871-72", Journal of the Royal Geographical Society, 45, 1875, p 92; T.V. Bulpin, The Ivory Trail (Books of Africa, Cape Town, 1967), pp 82 and 126; and NAZ: N3/33/8, History of Ndanga. 15 . J. Parker, Assignment Selous Scouts: Inside Story of a Rhodesian Special Branch Officer (Galago Books, Alberton, 2006), p 208. 16 . A. Wright, Grey Ghosts at Buffalo Bend (Galaxie Press, Salisbury, 1976), p 109. The title of native commissioner (NC) was replaced by district commissioner (DC) in the 1950s. 17 . Group interview with villagers, Chisa, 23 December 2014. 18 . Wright, Valley of the Ironwood, pp 259-260. 19 . P. Garlake, "Pastoralism and Zimbabwe", Journal of African History, 14, 4, 1978, p 483. 20 . J.K. Rennie, "Christianity, Colonialism and the Origins of Nationalism Amongst the Ndau of Southern Rhodesia, 1890-1935", PhD thesis, University of Chicago, 1973, p 136. 21 . Report, "Rhodesian Schools Exploration Society, Gonarezhou Expedition", 1962, p 68. 22 . Interview with Samuel Khumbani, Mahenye, 4 August 2014. Also see, NAZ: S2929/8/4, Delineation of Communities, Nuanetsi District, p 28. 23 . Interview with Munyamani Boyi Chauke, Chitanga, 2 August 2014. 24 . T.W. Sudia, "Domestic Tranquillity and the National Park System: A Context for Human Ecology", The George Wright Forum (1982), p 22; W. Cronon, "The Trouble with Wilderness, or Getting Back to the Wrong Nature", in W. Cronon (ed. ), Uncommon Ground: Rethinking the Human Place in Nature (W.W. Norton, New York, 1996), p 81; and J.A. Dixon and P.B. Sherman, Economics of Protected Areas. A New Look at Benefits and Costs (Earthscan Publications Ltd, London, 1990), p 13. 25 . C.M Hall and W. Frost, "The Making of the National Parks Concept", in W. Frost and C.M. Hall (eds), Tourism and National Parks, International Perspectives on Development, Histories and Change (New York: Routledge, 2009), p 3. 26 . M. Adams, "Beyond Yellowstone? Conservation and Indigenous Rights in Australia and Sweden", in G. Cant, A. Goodall and J. Inns (eds), Discourses and Silences: Indigenous Peoples, Risks and Resistance (University of Canterbury, Christchurch, 2005), pp 127-138. 27 . M. Borgerhoff Mulder and P Coppolillo, Conservation: Linking Ecology, Economics and Culture (Princeton University Press, Princeton, 2005); and P.A. Chhetri, A. Mungisha and S. White, "Community Resources in Kibale and Mt Elgon National Parks, Uganda", Parks, 13, 1 (2003), pp 28-38. 28 . Sudia, "Domestic Tranquillity and the National Park System", p 22; Hall and Frost, "The Making of the National Parks Concept", p 3. 29 . M.M. Cernea and K. Schmidt-Soltau, "The End of Forcible Displacements? Conservation Must Not Impoverish People", Policy Matters, 12 (2003), pp 44-46. 30 . J. Igoe, Conservation and Globalization: A Study of National Parks and Indigenous Communities from East Africa to South Dakota (Thomson Learning, Belmont, 2004) pp 71, 79 and 83. 31 . J. Carruthers, The Kruger National Park: A Social and Political History (University of Natal Press, Pietermaritzburg, 1995), pp 33. 32 . NAZ: S1651/46/1, Evidence of E.J. Kelly Edwards, 21 March 1949. Also see, NAZ: S4061, D. Chavhunduka, "Is there a Future for National Parks in Zimbabwe: What are the Pressures on them?" Wild Rhodesia, 17 (October 1978), p 14. 33 . NAZ: SRG/3, Annual Report of the National Parks Advisory Board for the Year Ended 31 December 1949, Presented to the Legislative Assembly, 1950. Also see, NAZ: S4061, T. Davidson, "Report on Wankie Game Reserve, October 1928-March 1930", Wild Rhodesia, 17 (October 1978), pp 3-5; NAZ: S4061, Chavhunduka, "Is There a Future for National Parks in Zimbabwe? ", pp 10-14; S. Mombeshora and S. Le Bel, "People-Park Conflicts: The Case of Gonarezhou and Chitsa Community in South East Zimbabwe", Biodiversity Conservation, 18 (2009), p 2602; and T. Davidson, Wankie: The Story of a Great Reserve (Books of Africa, Cape Town, 1967). 34 . Wolmer, From Wilderness Vision to Farm Invasions, p 12. 35 . NAZ: S1651/46/1, Evidence of E.J. Kelly Edwards, 21 March 1949. 36 . See, Land Apportionment Act, No. 30, 1930. 37 . NAZ: S914/12/1B, Acting Secretary, Commerce and Transport to Col. the Hon. Deneys Reitz, Minister of Lands, Pretoria, "Gona-re-Zhou Game Reserve, National Park and Game Reserve Scheme, Government Proclamation Gazetted", 28 September 1934. 38 . NAZ: S914/12/1B, Divisional Road Engineer to CRE, 12 June 1932; and NAZ: S1532/91/2, Game, 1922 to 1939, Vol. 2, Acting ANC Nuanetsi to NC Chibi, 11 November 1934. 39 . S. Khan, "Sustainable Development and Community Participation: A Case Study of Great Limpopo Transfrontier Park", Paper delivered at 2nd Conference IESE Dinamicas da Pobreza e Padroes de Acumulacao em Mocambique, Maputo, 22 to 23 April 2009, pp 1-3. Also see Carruthers, The Kruger National Park, pp 43 and 92. 40 . NAZ: S914/12/1B, Report on area in Crown Lands between Matibi No. 2 Native Reserve and Portuguese East Africa Border Line, Re-Game Reserve. Also see, NAZ: N3/24/2-4, NC Chibi to CNC, "Re: Native Reserves", 4 August 1900; The Sunday Mail, "Slaughter of Game Again", 1 March 1964; The Sunday Mail, "Gonarezhou Must Not Die", 22 March 1964; and Bulpin, The Ivory Trail, p 121. 41 . Child, "Report of the Director of National Parks and Wildlife Management", p 21; and H. de Laessoe, "Ordinary Meeting, 28 August 1906, The Lundi and Sabi Rivers", Proceedings of the Rhodesian Science Association, 6, 2 (1907), p 123. 42 . NAZ: N3/24/2-4, NC Chibi to CNC, "Re: Native Reserves", 4 August 1900. 43 . Bannerman, "Hlengweni", p 483; and NAZ: S4061, Chavhunduka, "Is There a Future for National Parks in Zimbabwe?" p 14. 44 . Wolmer, From Wilderness Vision to Farm Invasions, pp 147-148. The Department of Commerce was more interested in promoting tourism in the area. 45 . NAZ: S1532/91/2, Game, 1922-1939, Vol. 2: CNC to Acting Secretary, Department of Agriculture and Lands, 8 January 1935; and NAZ: S1542/G1/1, CNC to Minister of Commerce and Transport, 13 November, 1933. 46 . C.C. Mavhunga, "The Mobile Workshop: Mobility, Technology and Human-Animal Interaction in Gonarezhou (National Park), 1850 to Present", PhD thesis, University of Michigan, 2008, p 252. 47 . Wright, Valley of the Ironwoods, pp 34 and 64-65. 48 . Southern Rhodesia, Land Apportionment Act Amendment Act, No. 37 of 1961. 49 . NAZ: TH10/1/1/161, "Nyamutongwe Ruins, Postscript". 50 . NAZ: SRG/3, Annual Report of the National Parks Advisory Board for the Year Ended 31 December 1950, Presented to the Legislative Assembly, 1951. 51 . Interview with Ward 10 Councillor, Mabalauta (GNP), 5 September 2014. 52 . Mombeshora and Le Bel, "People-Park Conflicts", p 2609. Chief Chisa is wrongly captured as Chitsa in most colonial literature. 53 . Interview with Paulus Chikomba, Village Head, Chisa, 28 June 2014. 54 . M. Adams, 'Negotiating Nature: Collaboration and Conflict Between Aboriginal and Conservation Interests in New South Wales, Australia', Australian Journal of Environmental Education, 20, 1 (2004), p 5. 55 . Interview with Headman Mpapa, Mpapa Village, 21 July 2014. Also see Mombeshora and Le Bel, "People-Park Conflicts", p 2609. 56 . A.S. Mlambo, A History of Zimbabwe (Cambridge University Press, New York, 2014), pp 146-148; J. Barker, Rhodesia: The Road to Rebellion (Oxford University Press, London, 1967), p 18; Preventive Detention (Temporary Provisions) Act, No. 39 of 1959; Southern Rhodesia Law and Order (Maintenance) Act, 1960; and State of Emergency Act, 1959. 57 . Interview with Paulus Chikomba, Village Head, Chisa, 28 June 2014. 58 . Interview with Enias Masiya, Guluji Ward 22, 28 June 2014. 59 . Interview with Paulus Chikomba, Village Head, Chisa, 28 June 2014. 60 . Group interview with villagers, Chisa, 23 December 2014. 61 . Interview with Enias Masiya, Guluji Ward 22, 28 June 2014. 62 . Interview with Joshua Dzviriri, Mupinga, 17 April 2014. 63 . Ngwenyeni was also incorrectly referred to as Ngwenyenye in colonial narratives. 64 . Wright, Valley of the Ironwoods, p 49. 65 . MRC: MS 22, Delineation Report on the Ngwenyenye or Marumbini Headmanship and Community, p 84; and NAZ: TH10/1/1/193, "Sacred Places". 66 . Interview with Headman Ngwenyeni, Malipati, 24 July 2014. 67 . Wright, Valley of the Ironwoods, p 268. 68 . Wright, Valley of the Ironwoods, pp 329 and 339-340. 69 . Wolmer, From Wilderness Vision to Farm Invasions, p 151. 70 . Interview with Headman Ngwenyeni, Malipati, 24 July 2014. 71 . Wright, Valley of the Ironwoods, p 329. 72 . Group interview with villagers, Chisa, 23 December 2014. 73 . MRC: MS 22, Delineation Report on the Ngwenyenye or Marumbini Headmanship and Community, p 87. 74 . MRC: MS 22, Delineation Report on Ngwenyenye or Marumbini Headmanship and Community, p 87. 75 . MRC: MS 22, Delineation Report on Ngwenyenye or Marumbini Headmanship and Community, pp 87-88. 76 . MRC: MS 22 Delineation Report on Ngwenyenye or Marumbini Headmanship and Community, p 88. 77 . The government used soldiers and the police to drive the people out. This was revealed in interviews with Lyson Chisaka Masango, Mahenye, 6 August 2014; and Mhlava Chirhindze, Mahenye, 7 August 2014. 78 . Interview with Mhlava Chirhindze, Mahenye, 7 August 2014. 79 . Wright, Valley of the Ironwoods, p 341. 80 . NAZ: SRG/3, Annual Report of the National Parks Advisory Board for Year Ending 1968, Presented to the Legislative Assembly, 1969, p 23. 81 . Interview with Headman Ngwenyeni, Malipati, 24 July 2014. 82 . NAZ: SRG/3, Annual Report of the National Parks Advisory Board for Year Ending 1968, Presented to the Legislative Assembly, 1969, p 23. 83 . Wright, Valley of the Ironwoods, p 335. 84 . The district commissioner, Allan Wright, was nicknamed "Chibgwe" (hard stone) because of his alleged ruthlessness in dealing with his African subjects. 85 . Wright, Valley of the Ironwoods, p 334. 86 . Wright, Valley of the Ironwoods, p 334. 87 . Wright, Valley of the Ironwoods, p 335. 88 . Wright, Valley of the Ironwoods, p 335. 89 . Soon after taking over the Nuanetsi District in 1958, Wright established a web of African spies in the entire district. It is most probable that the system was activated to intimidate the people, hence their withdrawal from the Salisbury trip. 90 . Wright, Valley of the Ironwoods, pp 335-336. 91 . NAZ: SRG/3, Annual Report of the National Parks Advisory Board for the Year Ending 1968, Presented to the Legislative Assembly, 1969, p 5. 92 . NAZ: S4061, "Land Use", Wild Life Society of Rhodesia, Newsletter No. 40, January 1970, p 3. 93 . NAZ: SRG/3, Annual Report of the National Parks Advisory Board for the Year Ending 1968, Presented to the Legislative Assembly, 1969, p 23.